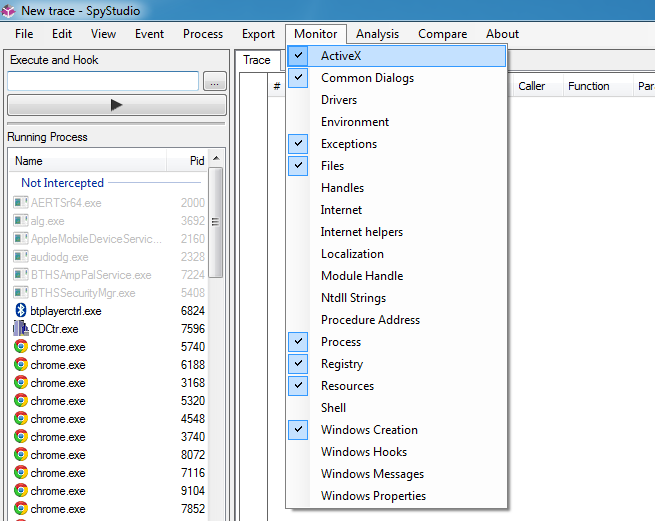 Common Dialogs: Dialogs included in comdlg32.dll. Drivers: IOCtls and Driver communication. Exceptions: handled and unhandled user-mode exceptions thrown. Files: File and directory access. Handles: Windows handles query functions. Internet: Wininet.dll functions. Set of high level functions that Internet Explorer use to browse. Internet helpers: Urlmon.dll functions that are used by Internet Explorer to access Wininet.dll in a multi-threaded context. They also include Zone implementation and some Internet Explorer options. Localization: Functions used to get current language settings. Ntdll Strings: Ntdll string initialization functions. Useful when you know that a specific string appears after certain event (e.g. : a crash or an issue). Process: Library loads and Process creation. Resources: Load and find resources. Shell: Shell32 functions that are used to find programs, open file with default program, convert file paths and tons of shell related help functions. Windows Creation: Window creation and destruction. Windows Hooks: SetWindowsHook functions used to install message filters. Windows Messages: SendMessage, PostMessage and show window. Windows Properties: Windows properties such as TItle, Visible, etc.